Generally this type of curry is done on festival days. But this is an excellent combination with jeera rasam (Type 1 and Type 2) mixed with hot rice and a little ghee. This is done with brinjals also. You can see the brinjal saamaan podi here. De-skin and chop bananas into slightly big cubes. Cook them in boiling water with salt and turmeric powder until 3/4th done. Heat oil in a heavy bottomed pan, add mustard seeds, urad dhal & red chillies . When golden brown add curry leaves and 3/4th cooked bananas. Saute well by flipping it gently . 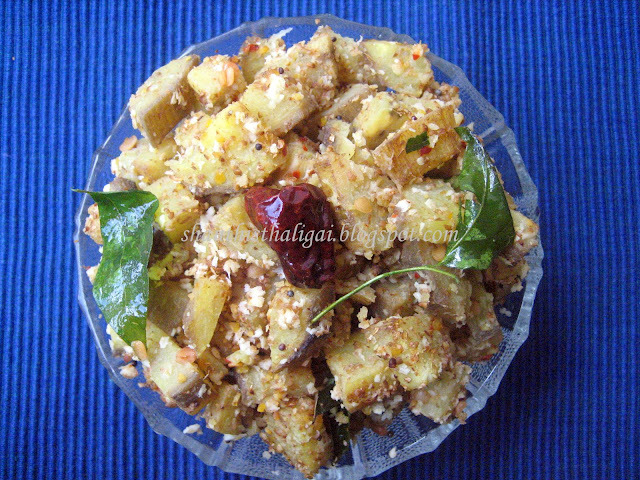 When it is finished, add grated coconut and karamudhu podi. Saute for 2 more minutes. Vazhakkai saamaan podi karamudhu is ready. simple and easy side dish! Hi. I must try this preparation, sounds simple and the podi is also simple to make. Truly said Shanthi, apodiyitta kari with jeera rasam tastes just out of the world. looks apt for rice.. my MIL also prepares similar recipe.. no urad dal in her recipe..btw what is karamudhu phodi?.. i want 2 try this.. Thank you so much for visiting me. You have a lovely place here! This with Jeera rasam is indeed a wonderful combination. Simple and delicious food! Hi, thannks for visiting my blog. You have a wonderful blog with great recipes! I also do similar type of dish! got to try ur version next time.. I found your blog only recently. And, am so glad I did. My thaligai doesn't have the true iyengar flavor and sometimes I miss my Amma's thaligai a lot. Now, hopefully, I can try out some traditional iyengar recipes and get a taste of home (away from home). Came across your blog thr your comment on my blog..
Can you please post the ingredients for saamaan podi? I tried clicking on the saamaan podi link...I guess it is removed...it will be very helpful if u repost it..